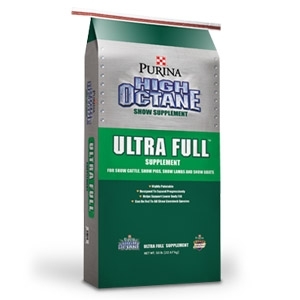 Purina High Octane Ultra Full show supplement is now available at J&N Feed and Seed. Ultra Full show supplement will help you achieve the desired results you need with your show project. High Octane® Ultra Full™ supplement is designed to help support fill in the lower body and flank areas through controlled, progressive expansion. Ultra Full™ supplement can be fed in combination and compliments our High Octane Depth Charge supplement. It’s proprietary ingredient blend enhances palatability to help stimulate feed intake and can be fed to all show livestock species. Stop by J&N Feed and Seed for all your show feeds, supplements and supplies. Let us help you raise a winner this year! This entry was posted on Tuesday, October 13th, 2015 at 5:31 pm	and is filed under News & Updates, Show Chow. You can follow any responses to this entry through the RSS 2.0 feed. Both comments and pings are currently closed.